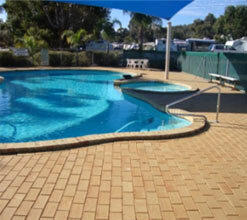 Caravan Sites, Fully Equipped Cabins and Park Homes. The Hillside Garden Village offers double the views, overlooking the picturesque lights of Perth below at night and the wildflower covered hills by day. You will feel you are a million miles away from the hustle and bustle of the City and suburban life. Tree lined streets and meticulously manicured gardens amidst modern, convenient facilities including car wash bay, beautiful shaded pool, and excellent BBQ facilities. 270 South Western Highway, Armadale. 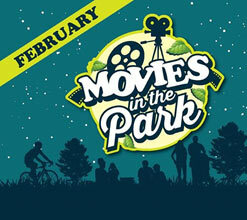 Enjoy a relaxing outdoor cinema experience with friends and family at Movies in the Park. Bring a picnic rug and hamper to start these perfect summer evenings outdoors in the fresh air and natural beauty of some of the City’s most picturesque parks. To add to the ambience of the evening a local community group runs a sausage sizzle. Ride your bike and get it serviced for free. Once the sun goes down and darkness prevails the featured family movie of the night begins. Serpentine Falls, located in the Serpentine Falls National Park is a beautiful location to take you and your family for a day trip. 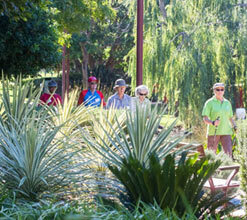 It has well kept picnic grounds set in natural surroundings full of native birdlife. The falls are located about 400 metres from the picnic grounds but there is a falls car park closer for those who aren't so able or energetic! 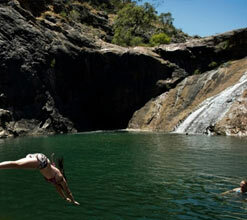 Take a cooling swim in the water hole in front of the falls – very refreshing on a hot summers’ day. From the picnic grounds, enjoy a nature walk to Kitty's Gorge following the Gooralong Brook, which feeds the falls, Baldwin's Bluff Nature Trail will take you to the top of the escarpment where you will be greeted with spectacular views of the falls, coastal plains and the Perth Skyline. National Park Day Pass Fees apply. Check with the Armadale Visitor Centre for park closures. Pole walking is walking with a set of specially designed poles to assist and further enhance everyday walking. It is a fun and functional way to exercise and is considered the ‘Best All ln One Workout’ in the world. Pole walking promotes health and wellbeing. It exercises the mind and body. If you would like to be a part of a pole walking group, please contact The Armadale Visitor Centre, 40 Jull Street, Armadale 9394 5410, visitorcentre@armadale.wa.gov.au.